Here’s a task I am willing to bet goes ignored by a lot of us: organizing your computer. Working from home means your computer (or laptop, or tablet, or notebook — whatever you use for work) will inevitably become cluttered. Files saved every which way, folders that don’t seem to make sense (though they did when you created them). You’ll download something only to discover later that you had already downloaded it before, forgotten where it was, and now you have three copies in three different folders. Cluttered computers can ruin your efficiency. Not only that, but it’s frustrating to try to find a file on your computer that you know is there and you just can’t seem to find because you don’t know where you put it or what you called it. Ha…guess what I was doing all weekend? We all have those catch-alls…those spaces in our computers where we download, save, and throw files with the intention of moving or organizing your computer later. Except that then we don’t go back and move them, do we? My biggest downfall is the Downloads folder. Everything is in there: folders, images, graphics, books, courses, software, apps, photographs from my phone. I mean everything. So, a big whopping deal that my desktop looks neatly organized (I’m actually really good about keeping the desktop itself nice and clean — but my folders are a mess)! So, let’s take a few minutes and go over some steps to help you with organizing your computer. Believe me, the next time you sit down to do something, you’ll be so glad you managed to do this. I have a laptop I bought for school. Now, I have already graduated from graduate school and have no plans to go back to school for anything. So right now, of course, it is no longer being used for school. But…do you think I used it solely for school when I was in school? That laptop did (and still does) have all my papers, research, and syllabuses saved on it. But it also has photographs of my daughter, papers for work, work emails, personal emails, contracts, novels, and anything else that I happened across while on it. Our computers hold all kinds of digital resources — things we use in our professional and personal lives. It doesn’t matter how well you try to keep personal and professional from overlapping on your computer, the fact of the matter is, they will get mixed up from time to time. From family photos to financial records, the data we store on our hard drives is very important — at least at the time we saved it. But, if your computer’s files are cluttered and disorganized, then how can you find the file you need when you actually need it? Here are some hints for tidying up the resources you keep on your computer. First and foremost, if you can, get an external hard drive. Not only will it help keep your most important files safe (in case the worst case scenario happens), but it can also be a lifesaver when you’re trying to organize all your files and folders. An external hard drive is an excellent way to store large amounts of content without bogging down or overloading your computer in the process. Having an external hard drive will make it easier to keep your computer clean and ready for you. I use a 2 TB Portable Harddrive by Seagate, and I love it. It makes backing up my files super easy (it’s literally just plug and play. Both my iMac and my MacBook recognized it instantly — plus it’s Time Machine compatible). Seagate also as a Windows-compatible hard drive for you PC’ers. Thanks to my external hard drive, I am able to keep a lot of files off my computers and pull them up only when I need them. And before you ask, no, my external hard drive isn’t exactly organized either. I basically have two folders on it: “From MacBook” and “From iMac.” And I search through when I need something. Maybe I should take some time to actually organize my hard drive, rather than using it as a locked closet to hide all my stuff from onlookers? It’s a lot easier than we know to accumulate..stuff. Have you ever moved from one apartment to another, or from one house to another, and wondered where all the stuff came from while you were trying to pack? It’s amazingly easy to just collect things. The same goes for our computers — after you’ve used your computer for some time, it’s almost impossible to avoid accumulating files that you don’t need any more (or, sometimes, that were never all that useful to begin with). Not only do these files take up valuable space on your hard drive, but they can also make it hard to find the useful files you are looking for. I use the same method of testing my old files as I do for my old wardrobe. Hide them in a folder, and move them when I pull them out to use. Anything still in that folder after a year can be deleted. But if you have a lot of files, or if this is the first time you’ve gone through to clean out and organize your computer, then you may want to actually go through and try to delete as many files as you can find that you don’t need anymore before sorting any into a to-be-deleted folder. With your files all thrown in the trash and deleted permanently, thrown into a to-be-deleted folder for later sorting, or safely tucked away in your new external hard drive, now it’s time to put together a file system that will help you keep your computer clean. Your computer uses a system of folders and infinite subfolders to keep your files organized. Much like a filing cabinet, these folders need to be carefully organized and maintained to be effective. Try consolidating your resources into a few top-level folders with other similar sub-folders within. For example, I have a folder for my blog called “Help Me Naomi” and inside I have several subfolders for the various aspects of this blog, such as “Graphics,” “New Courses,” “Blog Posts,” “Newsletter,” etc. And inside each of those is another tier of folders. So, whenever I want to post something to my Facebook Page, I know exactly where to look for it. There are dozens of tools available to help you keep your computer nice and organized. For example, you may want to use an online system like Evernote to help you keep track of things, back up files, and keep notes on different things without having to take up any room on your computer. Not only that, but with their Web Clipper, you can usually save notes and backups directly on Evernote without even having to save anything to your computer at all. No more saving and then uploading!! Duplicate Detective is an amazing app that will help you hunt down and trash duplicate files. And if you’re like me, you take about 32 Billion screenshots a day. And every single one of those screenshots end up on your desktop, just waiting for you to rename, sort, and edit. Well, now there’s a solution to that, too. Awesome Screenshot is a Chrome Extension that allows you to annotate and sort your screenshots when you make them. There is no perfect system or technique for organizing your computer or the hundreds of files kept on it. And there is no magical tool that will solve your organizational problems. The trick is to find a system that works best for you and stick with it. Schedule a weekly or monthly cleanup into your routine. 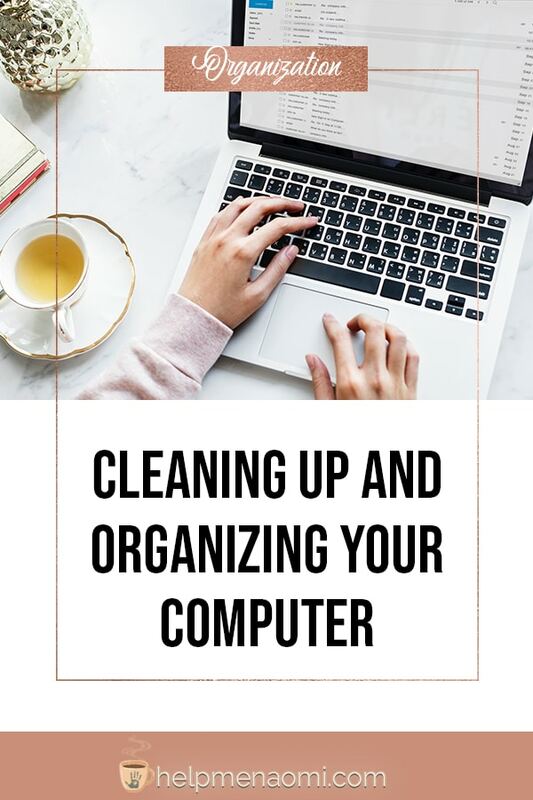 Hi Naomi, thank you for your detailed article about cleaning and organizing your computer. My computer needs cleaning and organizing badly…lol. It works very hard for me daily and its time I get it cleaned and organize since its already showing signs of slowing down. Hi Karen!! Thanks so much for the comment. I hope the article helps!! That’s how I discovered my need, bogged down my Mac for years, and I kept saying “it’s not Windows, it doesn’t need defragging.” LOL. But they’ll let you know when they need something!